But it's still dark out! How did you take that picture? I was hoping to be there but work is in the way. Prayers ascending, and hopefully we can get a report soon after the argument is finished. Are praying for you all, too. God be with you and may He grant His wisdom to the Court. And protect it from those who try to tear it apart and steal what has been given for the glory of God. Mary, Celebration Church is praying today. [Photo observation, our Commonwealth State House is towering in the Civil War photos, not it seems almost out of place with all the other buildings downtown]. By way of reference, if you look to the left of Capitol Square, you may be able to see St. Paul's Episcopal Church with the cupola or tower. St. Paul's is located at 815 East Grace Street, and has been reported in the R. T-D as hosting at least one SSB - yes, it has come to this. 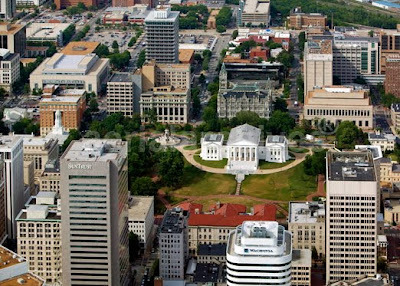 In front of (and adjacent to) St Paul's, also on 9th Street, (i.e., to the left of the SunTrust building) is the building for the Supreme Court of Virginia. Behind the SunTrust building - poking out to the right - is the Office of the Attorney General. Prayers ascending for the Virginia case.